This treatment deeply cleanses, exfoliates, extracts and hydrates the skin utilizing super serums filled with antioxidants, peptides & hyaluronic acid. STEP 1: Cleanses & Exfoliates using Actin-4, a Glucosamine & Lactic-Acid to Exfoliate sebum/oils & dead skin cells. Our multi-action specialized skin solution cleanses the skin deeply while softening sebum/oils & impurities to aid in extractions. STEP 2: A glycol & salicylic acid peel- cell sloughing capabilities to deeply clean & exfoliate. STEP 3: Vortex Extraction: a multi-action specialized skin solution formulated for oily & acne prone skin. This specialized blend cleanses skin deeply while its ingredients soften sebum/oil & impurities to aid in extractions. It actively assists in dislodging dead cells for exfoliation. It is tiny micro-injuries intentionally caused by a sterile, single patient use, cartridge of fine surgical needles. This needle cartridge is attached to a pen shaped device that contains an electric motor. There are controls that allow precise adjustment of the needle penetration depth and speed. As the machine glides over the surface of the area being treated, the needles penetrate the anesthetized skin, triggering the release of healing chemical mediators and softening scar tissue. The needles also create temporary channels through the top layer of the skin (the epidermis) which allows “direct” delivery of active healing products through this epidermal barrier. Dermaplane is a safe, non-invasive treatment which uses a special tool at a forty-five degree angle and stroked along the skin, while holding the skin taut to remove “peach fuzz”, as well as dead skin cells. Dermaplane is performed as a stand alone treatment or prior to other skincare treatments to enhance their effectives .This is a wonderful form of exfoliation that can be used with or without chemicals. This treatment does not require downtime and will effectively smooth acne scars and give you the smoothest possible skin. Dermaplanning enhances the effectiveness of other skincare treatments such as chemical peels and DiamondTome microdermabrasion by providing deeper product penetration. A safe, state-of-the-art ultrasonic treatment system that utilizes distilled water with low frequency sound waves for superior skin care results. It is a non-invasive device that improves all skin conditions. (My favorite and most recommended for any type of skin problem!) Medical studies report significant improvement in the skin after just one DermaSound treatment. What is a chemical peel and what are the benefits? EnzymePeel: Alpha-hydroxy acid or another mild acid is used to penetrate only the outer layer of skin to gently exfoliate it. The treatment is used to improve the appearance of mild skin discoloration and rough skin as well as to refresh the face, neck, chest or hands. When is a peel appropriate? What is the Skin Sheek Treatment and how does it work? Basically, A small probe is used to barely touch the skin, which vaporizes the growth or vein. The affected area dries, creating a very small crust that heals and flakes off in 3-12 days. In most cases, there is no visible indication of the previous growth. No scarring due to extraction, no risk of laser burns, and generally no series of treatments required. No need for expensive lasers or high cost maintenance and insurance. Clients describe their pain level as a 1- 3 on a scale of 1-10 and liken the sensation to a very quick stinging which dissipates quickly when the probe is lifted – the probe never pierces the skin.. The area will be pink right after, then scab a few days later. Eventually the scab will fall off and there will be fresh, new skin underneath. Please expect several days for the skin to heal and regain it’s natural color. It’s time for real answers. Do dermatologists keep giving you prescriptions that don’t work? Tried Proactiv and still breaking out? Considered going on Accutane, but think it’s too risky? Want Clear Skin? Already tried everything to clear your acne? You already are my favorite kind of client! — You’ve been promised so many times that an acne system or product was going to be your key to clear skin. You tried it and it didn’t work. Been there, done that. — The products you’ve tried in the past made your skin so irritated and/or sensitive that you just couldn’t take it any longer. And besides, you probably were still breaking out. — I GET it. 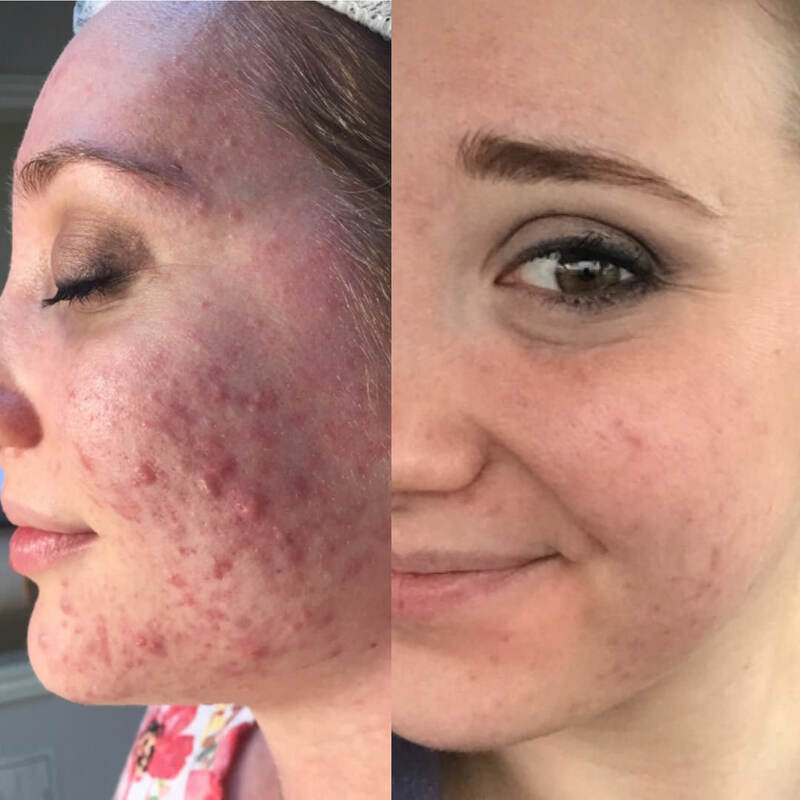 I had 3 out of 4 kids all on Accutane each doing several rounds – and it kept coming back. When I discovered and trained with Face Reality I finally learned what actually works. — Most of my clients are very skeptical when coming to me – what the heck do I know that everyone else has missed? A lot. 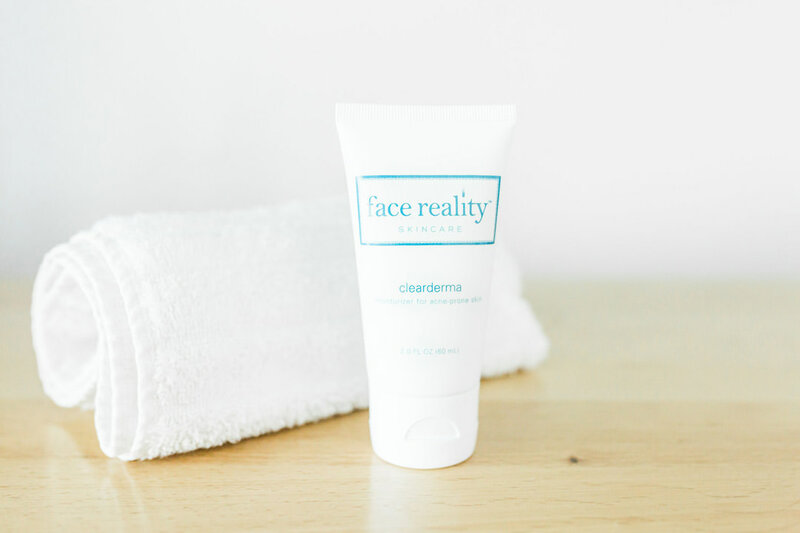 The Face Reality System approach takes into account everything about you – we custom-design a clear-skin plan for you. There is no such thing as a one-size-fits all system. Because everyone is just a bit different, we monitor you very closely to make sure you and your skin is on track to get clear and stay clear. So be skeptical — it’s healthy and expected. But let me be the last place you ever go to finally get clear skin. No worries- we got you covered! We have a 95% success rate with clients that take part in our Online Acne Program. We will conduct a consultation via Face Time. 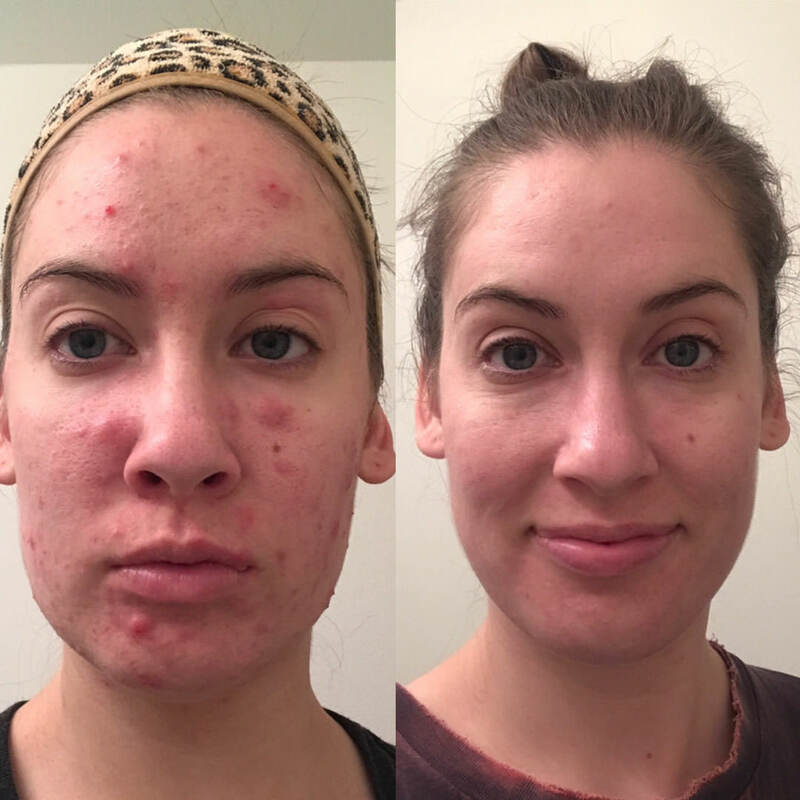 By the end of the consultation you will know exactly what your specific acne triggers are and have a full plan, created by your Clear Skin Coach for how to get clear. We will send you a confidential Health Questionnaire about your hormone health, gut health, stress levels, food choices and diet, current and past medications and lifestyle items used daily. Educate you on lifestyle habits and choices that aggravate acne-food, birth control pills, etc. Recommended home care products that you will need to get clear. Please be prepared to make lifestyle changes! This is a 16 week program. NOTE: Products are not included in the cost of the treatment. Expect to pay about $150 for your first set of acne products at your first appointment. We do not offer treatments or extractions to clients that do not use our home care products. We will want to see you every two weeks for an acne treatment. Perform an acne treatment with extractions, Gentle Chemical Peel, Dermasound therapy1, LED light therapy2, and High Frequency3. DermaSound Evens skin tone and smoothes texture, Minimizes pore appearance, Improves skin hydration and nutrition, Reduces Redness from inflammation. LED blue light therapy helps to kill the acne causing bacteria, reduce inflammation and provide a general rejuvenation effect on the skin. Usually, in the case of inflamed acne, topical products will bring down inflammation rather quickly. However, there are times when the skin needs a little more help in bringing down inflammation. This is where LED can help.The combination of blue, red and infrared lights in our Celluma panels get down to the core of the acne causing bacteria. The red lights help to reduce inflammation while at the same time, the blue lights help to kill the acne causing bacteria. We currently offer LED light therapy for face treatments only. The safe, gentle oscillating and oxygenating power of high frequency electrical current has been shown to enhance blood circulation, increase collagen and elastin production, eliminate toxins and acne-causing bacteria, encourage lymphatic drainage, exfoliate dead skin cells and improve skin care product absorption. The primary action of high frequency current is thermal (heat producing) and is characterized by a high rate of oscillation. Due to its rapid rate of oscillation, high frequency does not cause muscular contractions – instead, it works on the principle of skin toning. Combine my most favorite skin treatments. * Microneedling opens up channels into the dermis of the skin. This can introduce the peel into a much deeper layer and can result in a little more “heat” and a little longer downtime depending on your skin history. Combining the two also speeds up the process of skin renewal and regrowth. These two really compliment each other and work well together! Why should your lashes get all the attention when you can also remove the dead skin and velous hair? Combine the two and you’ll leave with hairless, bright, glowing, dewy skin and amazing lashes that are curled and tinted. All in one hour and at a great price! You’ll never forget the way your skin feels after combing these two amazing skin treatments. First we’ll remove dead skin and velous hair which immediatley diminishes the apprearance of fine lines and wrinkles with a 45 degree medical grade blade. Then we’ll use our state of the art DermaSound™, a non-invasive, 3-in-1 treatment device which uses water and low frequency sound waves to achieve amazing results. Your skin will aborb the pharmecuetical grade products that bring out the most beautiful glow you’ve ever seen- all customized according to your invidicual skin needs, creating a healthier, more radiant appearance.